Izek Jere is the forth-born of five boys. 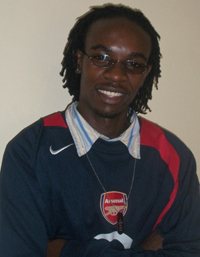 He grew up in Woodlands, a middle-to-upper class suburb in Lusaka. Following the untimely death of his father, his family relocated to Mtendere compound. This was a very difficult change for Izek; at the young and impressionable age of 13, he now found himself out of his element and surrounded by a much rougher crowd. There was a lot of pressure to drink and be sexually active. Izek had always been a good student and loved going to school, in part because he could hang with his best friend, Vernon. While Izek and Vernon were friends in school, outside of school they were two different people. Vernon was sexually active, often involving himself in risky behaviors. In 1998, he became very sick and stopped coming for school. Eventually, his family took him to the village and he died within a week. Izek was struck and saddened that such a youthful and talented friend was gone so suddenly. A few months later, Vernon’s mom invited Izek over. She had always liked and respected Izek and decided he needed to know the true cause of her son’s passing. Vernon had died of HIV/AIDS. At the time, there was still not much talk of the disease and there was also enormous amount of stigma attached. For this reason, Vernon’s family had decided to keep it a secret. Izek’s life was forever changed. He decided at that moment that he had to fight for his friend. He wanted to do what he could to make sure other young people didn’t follow the same road. AD also opened many doors for Izek. He had the opportunity to represent AD at a conference with Seeds Of Hope, a non-governmental organization, to work on the memory book project enabling OVCs (orphaned and vulnerable children) to express themselves through art. He was also asked to be amongst the group of peer educators to pre-test the curriculum for Grassroots Soccer (GRS), an organization that uses sports to teach life skills. The program proved successful and so Izek began working more with GRS as they expanded their work in Zambia. Eventually, Izek was hired as program assistant and soon promoted to his current position of program coordinator. With a salary in hand, Izek was able to take himself back to school and he went on to complete a diploma in social work with a foundation in IT.